The Discovery Channel will be chumming the waters of Blu-ray once again this summer. 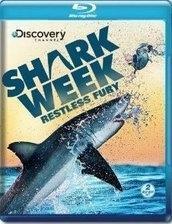 In an early announcement to retailers, Gaiam Americas says 'Shark Week: Restless Fury' for Blu-ray on July 19. Lurking silently beneath the ocean's surface is one of nature's most terrifying creatures - a powerful predator who can rip its prey apart in a matter of seconds! Now experience actual shark attacks and rescues capture on film. Learn why these attacks are increasing at an alarming rate and see the awe-inspiring lengths sharks will go to when they're after prey. Explore the science, myths and mystery of this fearless predator. Specs and supplements still haven't been revealed yet, but suggested list price is $24.98. You can find the latest specs for 'Shark Week: Restless Fury' linked from our Blu-ray Release Schedule, where it's indexed under July 19.